FRIDAY CATECHISM: I've been doing a lot of thinking since the death of Pope John Paul II. His loss has made me understand that, in many ways, I have come to define my own faith in terms similar to his, a process which he no doubt deserves some credit for. As I wrote in my eulogy, JPII was not interested in remaking the Catholic church in his own image or in the image of postmodernism; he accepted that some truths are universal and unchangeable, beyond the whim of public discourse. Although we may not have agreed up and down the line about all of these truths (one of my most profound objections as a Protestant concerns the beatification of Mary), we agreed about enough of them that this Pope had a major spiritual influence on me. Diane Knippers was to the liberal hierarchy of America's mainline Protestant churches what Václav Havel was to the Communist bosses of Czechoslovakia—not only a thorn in their side, but the leader of a growing moral and spiritual opposition. As head of the Institute on Religion and Democracy for 12 years, she took on the often lonely job of restoring the mainline denominations to a traditional, Bible-based faith. Rather than battle on behalf of classical Christianity, millions simply fled the mainline to join the Catholic Church or the Southern Baptists or a nondenominational church where the faith was not diluted or trendy. Knippers stayed and fought. She was soft-spoken and encouraging, and she turned IRD into a visible and influential force. The deeply politicized leaders of the Episcopal and Methodist and Presbyterian churches feared her, and they should have. She was relentless in exposing their apostasies and instrumental in organizing a populist revolution in the pews against them. "She always kept her eye on the ball," says Michael Cromartie, director of the Evangelical Studies Project at the Ethics and Public Policy Center. Havel's legacy is a free Czech Republic. Knippers's legacy will be a vibrant Protestantism free from the grip of churchmen who thought Christianity was just another name for their left-wing crusades. 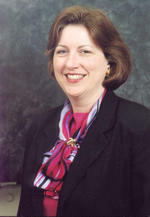 Diane Knippers died last week at 53. Knippers was not, however, without controversy. When IRD published a scathing report last September about mainline churches' policy toward the Israeli-Palestinian conflict, the National Council of Churches accused Knippers of playing "partisan secular politics." Knippers and the IRD often accused the NCC and the Geneva-based World Council of Churches of leftist political activity, and urged member churches to yank funding to both bodies. And all this time, I thought I was virtually alone as a mainstream Protestant. I certainly didn't know that there was an organized resistance to the hijacking of my faith by leftist lunatic apostates, whose current obsessions are divestment from Israel and ordination of gays, rather than the emptying of their pews and the mass exodus of the faithful to other religious bodies. I would never feel comfortable in an Evangelical congregation, even if they tend to stand for many of the things I believe in. And it's not for any lack of having attended Evangelical worship. The free-form liturgy, hazy doctrine on Holy Communion, and hand-waving "charismatic" praise is more than I can swallow. Having been raised Catholic, the Lutheran liturgy is already intimately familiar to me; all that has changed is the lack of veneration of the Virgin and that the consecration doctrine stops one step short of transubstantiation, both articles of the Catholic faith that I never believed for one moment of my life. Diane Knippers was fighting for me and for all the other mainline Protestants who do not want to abandon our congregations or our beliefs, and I didn't even know it. I miss her already.